Here are my minimalist posters for BReaking BAd episodes 2.01 and 2.02. I will be at HEROES CON in CHarlotte this weekend (Thu to Sunday). I will be sketching and have prints and sketchbooks (among other stuff) - pls feel free to stop by and say hi. Here is all the details about panels and sketching. I'm so excited to be back to one of my favorite shows ever, especially after missing it last year for health issues. A lot of people have asked me about my sketch availability and rates, so here's how I plan to handle that (subject to change if needed). Location: I'm in Artist Alley, table 313 (see diagram below), near dear friends like the Immonens and Mike Mignola. Panels: I'm on 2 panels Saturday & a panel on Sunday I hope you'll attend. How do you scare someone or repulse someone and at the same time entice them enough to buy your comic book? That is the challenge that Hellboy and BPRD face every time they release a book. Join Cap Blackard as he examines Hellboy Cover art with Mike Mignola, Becky Cloonan, Francesco Francavilla and Dave Johnson. Stop reading this program and get your-bad-self up here NOW!!!! Batman: Black Mirror with Scott Snyder and Francesco Francavilla--Join our stalwart Discussion leader Jason Wheatley (sorry ladies--he’s single) as he sits down with Snyder and Francavilla, the creative team behind the best-selling Batman: Black Mirror storyline. Bring lots of questions. This is going to be really good! Born on Twitter, several comic artists joined forces to draw a new character each week. Comic Twart is one of the longest running collectives of it’s kind! Visit them at www.comictwart.com/. 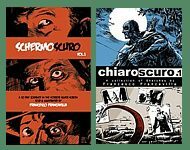 Please join fellow “Twarters”: Francesco Francavilla, Mitch Gerads, Andy Kuhn, Dan Panosian, and Ramón Pérez, Ron Salas and maybe more as they discuss this fabulous site and maybe create art right before your eyes! Signings: I will sign books and prints (and thank you for supporting me by buying my stuff)! If you have a lot of books and there's a long line, I may ask you to let me do it in batches just to be considerate to others. There might be some scheduling for the signing: if so, I will make sure to have a sign at my table. Above is a sample of a 9x12 full figure, fully inked sketch. Prints & Books: I'm driving so I will have a larger variety of prints with me. I'll definitely have some Black Beetle, Poe, Lovecraft, Phantoms of SPace (above), USRA, and lots of other prints. I'll also have a limited quantity of my sketchbooks (Chiaroscuro Vol.1 & Schermoscuro Vol.1). If there's something specific you want, I will gladly pre-sell these to you and you can pick them up at the show and save some shipping. Just email me for details and availability. here are my minimalist posters for BReaking BAd episodes 1.05 and 1.06.
here are my minimalist posters for BReaking BAd episodes 1.03 and 1.04. AMC was so sweet to air all seasons of Breaking Bad back to back (heading to the new season in July). Since I have never seen the show and I heard so many good things about it, I decided to dvr it (all episodes are aired very late at night). Tune in all week long for more. yesterday my issue of SWAMP THING (#10 - with my Detective cumpa' Scott Snyder) came out in all stores around the Country. Hope you guys picked it up: the reception so far has been great and the love is pouring in. Will post some of the reviews/comments later this week. While in stores, pls consider picking up also two other great books I provided covers for: THE SPIDER #2 by my Black Panther partner David Liss and artist Colton Worley, and THE LONE RANGER #6 by Ande Parks and Esteve Polls (really good, solid western book). When down-and-out alien exterminator Heath Huston stumbles upon an extraterrestrial plot to commit genocide against the human species, he must put down the bottle and resume his role as a peacekeeper . . . as The Last Fear Agent. 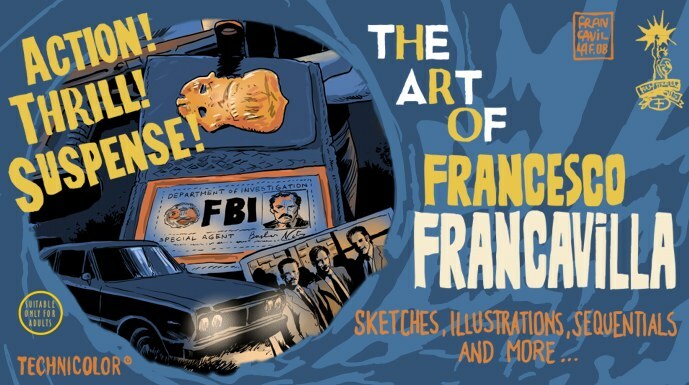 This deluxe hardcover omnibus, the first of two, collects issues #1-#15 of the acclaimed Fear Agent comics, along with half of the Tales of the Fear Agent side stories, covers, pinups, and artists’ sketch galleries! Mitch meets the person who’s been pulling the strings of his misfortunes since issue #1! As the CyberBorg continue to carve a swath of destruction across the galaxy, the Federation is met with the possibility of assistance, but from an unthinkable source! Will Captain Picard and the Doctor agree to an alliance that could be worse than the enemy they face? Mr. Novak, the man who used to pay Markham to kill innocent people, has been targeted for death and he's asked Markham to protect him. Will Markham save Novak, when he knows more people will die on Novak's orders? Markham's newfound moral code is put to its ultimate test! Kondo's trap succeeds beyond his expectations, as a bloody massacre leaves our heroes alone in the wilderness without hope of rescue. Deep in the kingdom of Buffalo Wong the object of everyone's desire is revealed, and Margo Lane and Pat Finnegan begin to see just how far Lamont Cranston will go in pursuit of his goals. Meanwhile, the Shadow begins to lay plans for a cataclysmic showdown with his foes. Tonto fights for his life in the present, as he fights for his soul in the past. The Native Ground arc rolls toward its bloody climax in a heart-breaking tale of loss and revenge.